Gift certificate winner Rita Buchan submits picture of Amish Originals table and chairs & wall unit. Anyone can enter! Just send us your picture and/or memory of your Amish Originals Furniture to get entered to win a $100 gift certificate. Winners chosen monthly and announced in our monthly newsletter and on our Facebook page. Picture of stunning table and chairs recently won our $100 gift certificate! Rita Buchan recently submitted a picture of her beautiful, custom-made table and chairs and was picked in our drawing. She won an $100 Amish Originals Furniture Company Gift Certificate! Her picture shows how her stunning furniture provides a perfect framework for her tablescape. It’s the focal point of a breathtaking room. What a fabulous place for her family and friends to gather throughout the upcoming holiday season. Thanks for sending in such a great picture, Rita! We are thrilled that you are so happy with your furniture. We enjoy helping you make your house a home. The large selection of furniture at Amish Originals is customized to your individual taste. And, we don’t just have dining room furniture. We have living room sets, including upholstered couches and chairs, bedroom sets, office furniture and many accent tables and unique decorations. 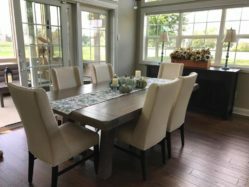 Customers can visit our sprawling showroom in historic Uptown Westerville, Ohio, and our friendly staff will help to choose the ideal wood, stain color, size and shape. Amish craftsmen from right here in Ohio will create your furniture by hand. Your one-of-a-kind furniture will fit seemlessly into your home and provide decades of enjoyment. It’s not difficult to win. Take a picture of your Amish Originals Furniture, tell us why you like it or share a memory and submit it in one of 3 convienent ways. We select winners every month to receive a $100 gift certificate. You can send us your entry via Facebook, Pinterest or email at info@amishoriginals.com.